adds new features, much greater capacity and a bigger price tag. ne size fits all" is an axiom that doesn't particularly suit the remote control industry. Not only are the audio/video systems controlled vastly different in scope - ranging from a TV and cable box to something that Lucas or Spielberg would proudly call their own - but the needs of those using the systems also vary. There's nothing that says someone with a modest home theater will be happy with a grocery store preprogrammed remote, nor that a connoisseur would want a full Crestron touchscreen station. After all, sometimes simpler really is better. With that said, there are a few undeniable facts: a 5-device remote won't adequately control a 10-device system, and someone who has spent five figures on a new home theater is going to want a universal remote that can make its operation easier, not harder. In these cases the most expensive or flashiest remotes may not be the best solution, but you're almost certainly going to need something considered high end. So what exactly constitutes a good high end remote? Being expensive would merely make it a luxury; instead it's the sum of the remote's features, capabilities and design that determine whether it can truly be called a high end product. And if Universal Remote Control Inc. (URC) has demonstrated anything in the past, it's that they know how to make a capable product - at any price point. It's with great interest that we now take a look at the Complete Control MX-950 "Aurora", URC's most advanced (and of course most expensive) traditional hard buttoned remote control. 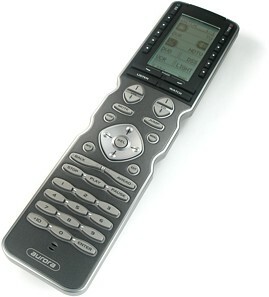 At $699 MSRP not only is the Aurora nearly three-quarters of the price of their deluxe MX-3000 color touchscreen model, but it also features many of the same sophisticated capabilities including variables, custom graphics, audio and a flexible memory structure offering control of up to 255 different devices. Sounds impressive, for sure, but does the MX-950 have everything needed to be worthy of its high end billing? For years Universal Remote Control Inc.'s retail products were known only under the "Home Theater Master" label. This changed recently when the company released a new mass market consumer series under the "Universal Remote Control" badge, an event that has been the catalyst for further product line reorganization. The MX-3000 was originally announced under the Home Theater Master banner, but suddenly moved over to a new elite "Complete Control" series targeted primarily towards custom installers and other audio/video professionals. The MX-950 Aurora is a part of that same high-end series, as are several of the company's more sophisticated products (known affectionately as the "vowel series" due to their product naming scheme). Meanwhile, the enthusiast-level Home Theater Master lineup's future is in question. Although it would appear to have become stagnant to new development, it's hard to say whether it is being phased out or whether the folks at Universal Remote are merely concentrating on expanding the upper and lower ends of their market. Either way, the average consumer will find Complete Control products harder to obtain than the Home Theater Master series, as they've been released under a more limited distribution model.